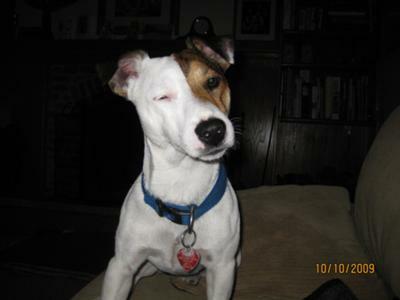 My Jack Russell Terrier is named Finnigan. He also has a sister named Kasey. Finnigan is proud dog; he has lots of character in looks and personality. his hi-energy and appetite for adventure rarely keeps in quiet for long; however, at the end of the day he enjoys a good cuddle. Finnigan was born on July 27, 2008 and is one terrific pet. Finnigan is adorable and sure has a proud Mom! Somehow, though - I think he's saying "where have you been all day?"